Please note: VacciCheck® can only be ordered by a licensed veterinary clinic, rescue, shelter or boarding facility under a veterinarian’s supervision. 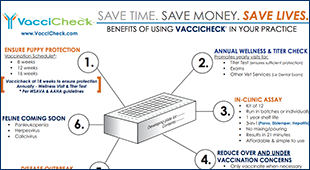 Click here For a list of international distributors of VacciCheck. Run VacciCheck in clinic with semi-quantitative titer results in just 21 easy minutes. Call today to order yours! 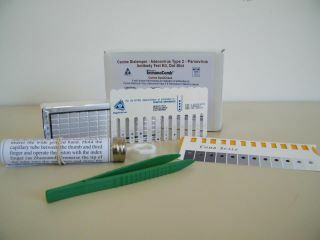 Kit includes supplies for 12 tests that can be administered individually: special 12 toothed Comb, developing plate, plunger, tongs, and quantitative scale for measuring results. Product is self contained and has a shelf life of 1 year. Spectrum Labs, the worldwide leader in serum allergy testing is proud to offer VacciCheck services. Simply submit 10 microliters of whole blood or 5 microliters of serum, along with the VacciCheck order form below. The assay will be run by our lab technicians the same day the sample is received, with semi-quantitative results sent out in approximately 24 hours. For questions please contact us here or give us a call at (800) 553-1391.